Are you a pink fanatic or a cool blue type of kid? Everyone has an opinion about colors. Some people wish they could paint their walls orange while others wish their clothes would all be purple. Step into the fantastic world of colors with a project that explores what shade you -- and your friends -- like best. Do boys have different favorite colors than girls? You'll need to start off by creating your testing materials. 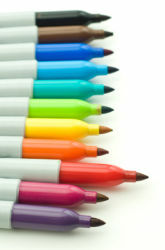 First, find take out these ten colored crayons: red, orange, yellow, green, blue, purple, brown, black, pink, white. Colour each white index card with one of the crayons. You don't have to colour the whole card -- just enough to adequately show off the colour. Resist creating any designs. The simpler, the better. Think about the question of this project: do you think being a boy or a girl will make a difference with favorite colors? 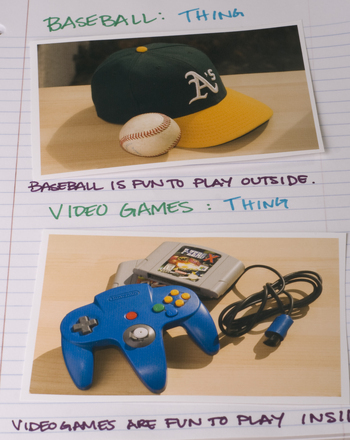 Write down your best guess, often called a Hypothesis, in your notebook. Test your first volunteer by displaying all ten index cards. Ask the volunteer to select one favorite colour. Record this in your notebook. Repeat this test with your remaining 19 volunteers. Make sure you test each volunteer one at a time. You don't want any of the other volunteers being influenced by a friend's favorite colour. When you're done, take a look at your notes. Create ten separate columns for each colour. Make tally marks for the boys under the appropriate colour column. For example, if two boys picked the colour orange as their favorite colour, place two tally marks in the orange column. Which column has the most tally marks? Did boys pick different favorite colors than girls? Experiments that test what volunteers like best will always depend on the volunteers. You might have noticed that blue was very popular among both genders, but that boys seemed to favor green while girls favored purple and pink. While colour preference may have some links to gender, those links haven't been proven. The truth is that all people are unique. All boys will never have the same favorite colour, and neither will all girls. The trickier truth is that society does influence what a person's favorite colour could be. Have you ever seen a baby announcement card for a girl? Typically, those announcements are pink, but baby boy announcements are usually blue. This kind of influence sometimes can make boys think they don't like pink -- because it's a "girly" colour -- and prefer darker shades instead. You want to know something interesting, though? The most common Favorite colour in the worldIs actually blue. Did you find that result in your test? Whether you got that result or not, science is a never-ending search for answers...and you just added yours. Keep guessing and testing new ways to explore colour preference. You can try testing a larger group of volunteers (what would happen if you tested 50 people instead of 20?) or ask volunteers to select their favorite shade of blue. Don't let the exploration stop here! Use this pretend survey of 38 people and their favorite cities to find out! 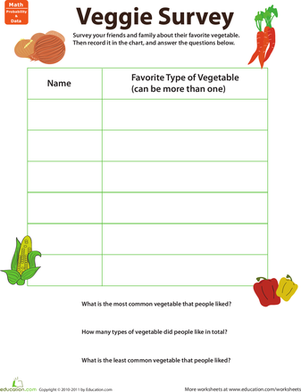 Give your second grader some practise working with data with this fun-to-complete favorite veggie survey. Red and Green: Complimentary Colors! Polly and Jolly are marvelous butterflies, here to help you learn about the complementary colors red and green! 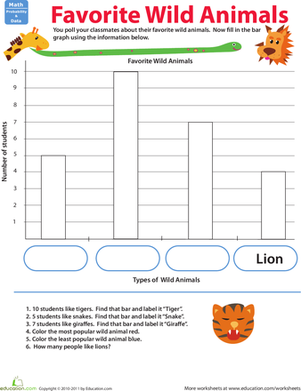 What's your second grader's favorite animal? How about the rest of his class? He'll use these results to make his own bar graph! Help your first grader understand what a noun is with this fun photo book that catalogs her favorite people, places, and things! First students will consider their favorite food while they fill in the structured pre-writing planner, then they can use the second page to write their opinion essay.